Martha designed this versatile top from some cotton she purchased at Treadle. Follow over to her flickr stream to see more views of this innovative top! 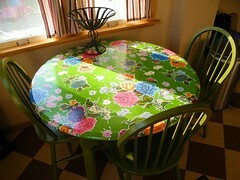 Sonja had a fantastic idea to attach elastic to a round of oilcloth to make a fitted table cover. This is definitely on my list of projects to make! If you haven't heard of Flickr, it is a user-friendly online site for folks to store pictures. Treadle Yard Goods has a group page on Flickr for folks to share what they're sewing with Treadle fabrics, and starting today, we'll showcase the best of those photos on this blog. It's free to join Flickr (Treadle Yard Goods is not affiliated with Flickr, I just use it personally, and I like the way it works) and we'll ask your permission to use any photo before we blog about it. When we see fabric leaving the store we often wish folks would bring in a photo of their finished projects. So, join in and let everyone see the great things that you all are sewing! We have just received the new Little Folks line of fabric from the very talented Anna Maria Horner. I am especially enamored of the Forest Hills print. 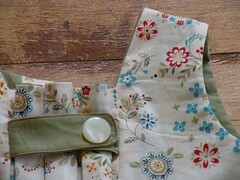 The new pieces are all in a voile weight, perfect for a blouse or lightweight dress for that tiny lady in your life. It's never too early to start sewing for Spring! Running now through Jan 10th, come in for some great deals on fantastic fabric! In October, Saint Paul was host to the team from Extreme Makeover: Home Edition. 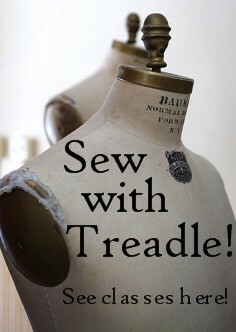 If you tune in tonight, see if you can spot the fabrics from Treadle! Mary generously donated fabric, and a couple of Treadlettes donated their time to help with the makeover for the very deserving Morris family of Saint Paul.